Senior graphic designer Anjali Lee is the woman behind the museum’s visual identity. From exhibition “logos” to invitations to the members’ magazine—that is her handiwork you see. And in a case of kismet, she had just moved to Honolulu with her boyfriend for his new job when she saw the museum was looking for a new designer. 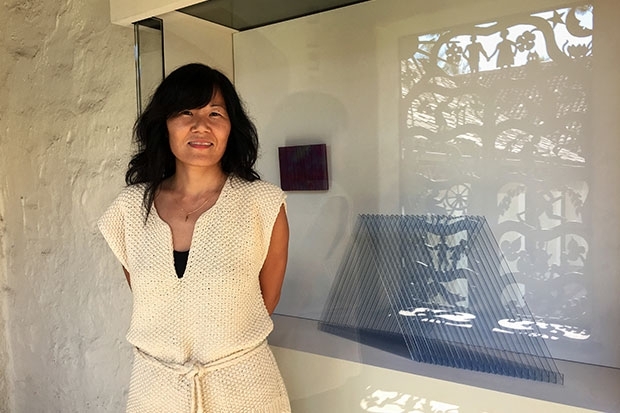 When asked to name her favorite work in the museum’s collection, she heads to Kinau Courtyard, and stops at the glass case outside the entrance to the Christensen Fund Gallery of Indonesian Art, where the sun shone on DeWain Valentine’s Open Diamond Triangle (1981). 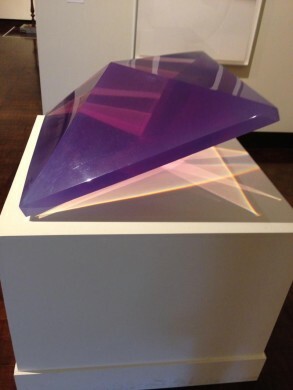 Anjali had not known of the artist until she saw Double Pyramid (1968) in American Array, the museum’s rotation of contemporary artwork that closed last January.